Here is Field #9. 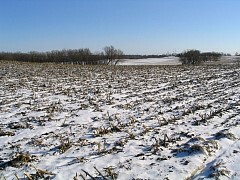 Note that compared to Field #5 the cornstalks in this field are all jumbled and tumbled up. The farmer didn't plow this field after picking the corn, but instead ran a disk over it. The disk partially turns the soil over, but doesn't completely flip it over like a plow would. A ploughed field can lose more moisture and is more susceptible to blowing away in the wind in the spring, or if bare (like now) in the winter. 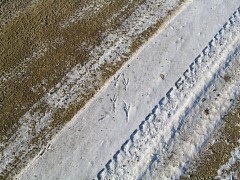 These are the tracks of a crow - note unsymmetrical toes. We've had a bit of a cold snap, the temperature is around 15 degrees Fahrenheit. 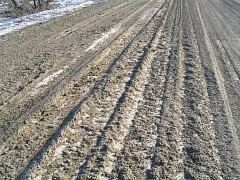 Just a few days ago the road was muddy, and now the mud has frozen with tire tracks preserved. The wild prairie rose, also known as the Arkansas wild rose (Rosa arkansana Porter). 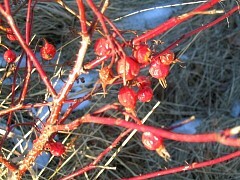 The red fruit are known as "rose hips" and contain several hard brown seeds. Cocklebur (Xanthium strumarium L.) plants near the West Farm. 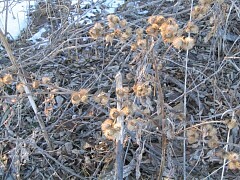 Cocklebur seeds and seedlings are poisonous, and young animals can be killed by eating the succulent seedlings. 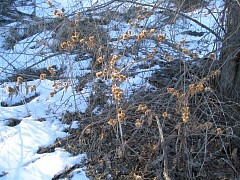 The spiny bur prevents the mature seeds from being eaten. I can't say how many of those cockleburs have stuck on my clothes while I am out hunting. They seem to favor sticking on the inside of shirt cuffs and pants bottoms. I wear hunting pants that have a panel made of tightly woven fabric that won't let these pesky burs attach themselves. I am walking out in Field #9 toward the mound. It's been snowing lightly and is about 20 degrees Fahrenheit. 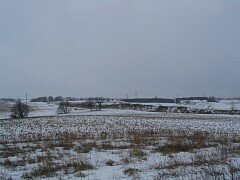 Before winter, the farmer dragged a disk over this land. 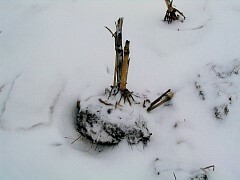 Here you see a hunk of soil around corn plant ripped roots and all from the ground by the disk. Here on the mound, a quick movement at my feet revealed the blurry of a field mouse. The hole he went into is the left-most center-bottom-most opening in the snow cover. 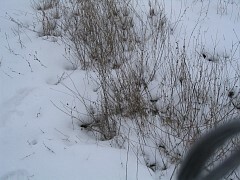 Approaching the gravel road, I noticed the difference in the color of the snow. Midwesterners know about how dirty at times the snow cover can get. 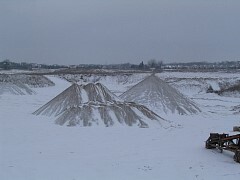 Small amounts of exposed topsoil lend a fine amount of dirt to the snow cover. 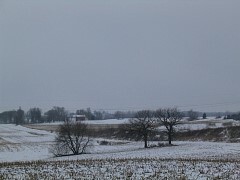 A new blanket of fresh snow is a welcome to once again restore the whiteness of winter. 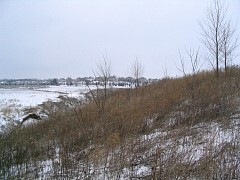 The Berm is in the background. 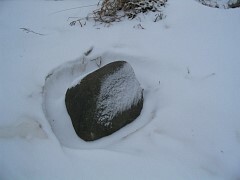 Okay, okay, just a rock with new slow clinging to it's face. The feet of the author on the gravel road. 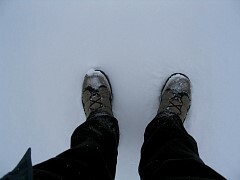 The new snow is not very deep. Coming back, heading north and just about to the power lines. I am going to take a left and leave the road to go view the gravel pit. Giant cones of gravel, destined for cement or road construction. 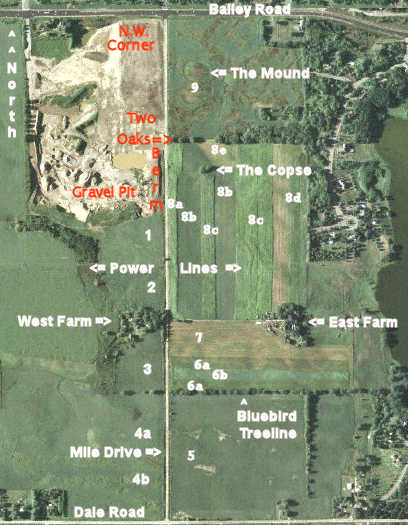 There are four gravel pits that I can think of in the surrounding area. Another one near my house has ended it's useful life and now has about 80 town homes built in it. 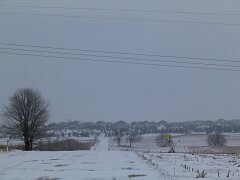 The street running through it is called "Quarry Ridge". Developer's are crazy people. As if "Ridge" takes away from the fact that you are living in a hole. The rumor is that this pit will become a holding pond as part of the county storm water drainage system. I am walking along The Berm Berm destroyed mid-2006 that separates the gravel pit from the gravel road. Often when I do this I flush pheasants - but not today. I did see lots and lots of sparrows though. In January I saw one dead on the road, probably the elder fellow of this sparrow community. 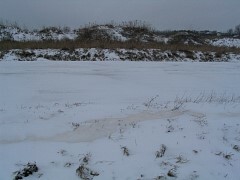 This berm will get flattened in the early summer. It wasn't a nataural formation anyway, but wildlife made use of it. In the distance you can see a gully that turned into a wildlife highway of sorts - pheasants used this a lot. 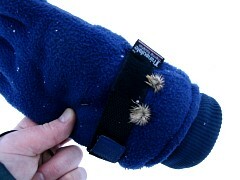 True to form, a cocklebur has attached itself to my glove as I walked trough the cover in the picture above.